Not content with just bringing the guidebook Keep Your School Safe to the Baltimore Jewish community, Frank Storch, with the Chesed Fund and Project Ezra, are sending the safety handbook to all Jewish schools and other institutions all over North America. The first printing of this comprehensive guidebook consisted of ten thousand copies and is intended for every Reform, Conservative, Orthodox and community day schools. An additional handbook is underway right now which will be sent to all public and private schools throughout North America. The guidebook was published in memory of the 20 young students and 6 dedicated teachers and staff who were brutally murdered at the Sandy Hook Elementary School in Newtown, Connecticut last December. It is also dedicated to the victims who died as a result of the terrorist attack at the Boston Marathon in April. For more information and resources please visit www.keepyourschoolsafe.com. 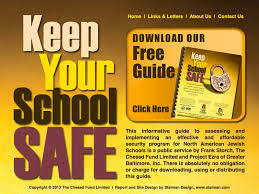 For any questions or comments please call 410-358-2525 or email info@keepyourschoolsafe.com.